Visitors to the opening of the First Papers of Surrealism exhibition in New York in 1942 were disorientated, not only by Marcel Duchamp’s famous ‘mile of string’ installation, but also by the presence of a group of children who, at Duchamp’s instigation, bounced balls and played hopscotch among them. This paper looks closely at the implications of this dramatic incursion of play into the gallery setting, arguing that this seemingly minor intervention was a significant comment on avant-garde attitudes to work and play. If the installation of the show was dramatic enough, its opening reception, or ‘vernissage’, which took place on 14 October 1942, was even more unusual. Wealthy art patrons and members of New York’s cultural elite milled around, attempting to make what they could of the strange web or net in which they were caught, peering through it to look at the paintings, while a number of children wove in and out of the guests, eventually carving out a space for themselves in the central area of the exhibition. From all accounts the group of children, led by the eleven-year-old Carroll Janis (son of the art collector Sidney Janis), consisted of six boys dressed in baseball, basketball and football attire, who threw balls among themselves, and six girls who played skipping games, jacks and hopscotch. They were under strict orders from Duchamp to carry on playing throughout the event, and to explain, if questioned, that they were playing on Duchamp’s instructions. Duchamp, incidentally, was nowhere to be seen. As was his custom he had decided not to attend the opening.5 What was Duchamp articulating by allowing a group of unruly kids to overrun the exhibition, not only within the context of surrealism, but more broadly in relation to his understanding of the avant-garde and its relationship to the spaces of the gallery or museum? The cat’s cradle-like installation, quite apart from its iconoclastic role in cancelling out some of the paintings, may have a more direct relationship to the children’s games than has thus far been acknowledged. While Duchamp scholars have tended to see the ’mile of string’ installation as alluding to the displacement and disorientation of the surrealist group at this time – not least because most of the artists had only recently arrived in the US after difficult passages out of wartime Europe – the concept of play was obviously central to the opening of First Papers of Surrealism.6 What this paper examines, then, is the extent to which children’s play and childhood were central preoccupations of Duchamp’s artistic milieu in New York during the latter half of 1942. Duchamp, of course, had always been interested in play. Toys or allusions to toys have a role in his early work, for instance in the drawing titled Walking Doll (Bébé marcheur), seemingly based on a product available during the period, which was published in the illustrated journal Le Courrier français in January 1910. A form of mock-advertisement, the image contains a list of the doll’s attributes, which concludes with the assurance that ‘she undresses completely’. A caption accompanying the illustration asserts that the product is from a ‘catalogue for elderly gentlemen’, leaving little doubt that this is a risqué allusion to paedophilia and prostitution.7 As the art historian Arturo Schwarz has observed, this drawing of a doll who undresses appears to prefigure the ‘bride stripped bare’ of Duchamp’s major work, The Large Glass 1915–23 (see Tate T02011). It should be noted that the ‘bride’ who ‘strips’ at the command of the ‘bachelors’ within the complex iconography of The Large Glass (an iconography which has to be deduced from Duchamp’s notes for the work) has other dark, toy-like connotations. The idea of the ‘bride’ seems in fact to have its origins in the wedding tableaux in the country fairs of Duchamp’s youth, where spectators threw balls at the heads of mannequin bridal couples.8 The element of black humour involved here also seems to underpin the bilboquet that Duchamp gave to his friend Max Bergmann as a gift in 1910, and which can be seen as a precursor to the readymades that he produced a few years later. A bilboquet is a traditional French toy consisting of a lathed spike attached with string to a wooden ball. Play involved penetrating the ball with the spike, which seems, in terms of Duchamp’s dialogue with Bergmann, to have been supplied with sexual connotations as a reminder of the amorous adventures shared by the two young artists in Paris.9 It is clear, then, that references to popular amusements and children’s playthings were formative elements of Duchamp’s iconography, and related to this is the fact that Duchamp was deeply preoccupied throughout his life with chess, the pre-eminent game of intellectual combat and strategic forward-thinking, at which he became an international-level player.10 However, in bringing children into the exhibition space in 1942 Duchamp was not just nodding to a preoccupation of his own; he was also responding to the cult of childhood within surrealism, which had manifested itself in various ways in the surrealist art and writing of the 1920s and 1930s. The surrealist interest in childhood is a massive topic in its own right and can only be touched upon briefly here. Near the beginning of the ‘First Manifesto of Surrealism’, authored by Breton, it is stated that ‘Children set off each day without a worry in the world. Everything is near at hand, the worst material conditions are fine. The woods are white or black, one will never sleep’.11 This late Romantic conception of the child’s uncontaminated imaginative faculties, and Breton’s numerous poetic invocations of the child’s closeness to the wellsprings of the ‘marvellous’, would give way in the 1920s and 1930s to the surrealist fascination with the ‘femme-enfant’, the woman-child who is supposedly closer to irrational forces. 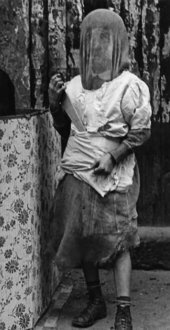 It is at this point that the imprint of Freudian psychoanalysis can be detected on the work of Breton and his fellow surrealists, who became compelled to reconcile their idealisation of childish innocence with a darker sense of the child as prey to ungovernable sexual drives.12 The symbolic centrality of the ‘femme-enfant’ was emblematised in a famous photograph of the child prodigy Gisèle Prassinos reading her poetry to a group of surrealists in the 1930s, but the image is ubiquitous in surrealist art. For example, in Max Ernst’s Two Children are Threatened by a Nightingale 1924 (Museum of Modern Art, New York) an adolescent girl from the pages of a Gothic novel dangerously wields a dagger, while in Dorothea Tanning’s Eine Kleine Nachtmusik 1943 (Tate T07346) two adolescent girls appear to spawn disturbances in the natural order, such as the emergence of a massively enlarged sunflower, which seemingly grows from one of them.13 But of all the surrealists the German artist Hans Bellmer is most closely linked with imagery of the sexualised (female) child, the paedophilic associations of his work demonstrating how far the surrealist attitude towards childhood could stretch: from a Romantic veneration of the child’s imaginative openness to a Sadean exploration of its potential ‘perversity’ (the latter of which returns back to Duchamp’s Walking Doll). It would seem, then, that the dialogue between Duchamp and Cornell, as far as the discourse of the miniature and the toy was concerned, turned on their inhabitation of two ‘mental epochs’: Cornell was essentially a Romantic and a symbolist, while Duchamp more properly inhabited the post-industrial moment of the mid-twentieth century. But this is not to deny the obvious impact that one man had on the other. The two had met initially in January 1934 when Duchamp was installing a Constantin Brancusi show at the 57th Street Gallery in Manhattan, and had renewed their acquaintance in June 1942.17 From this point until early 1943 Cornell helped Duchamp construct six of his boîtes-en-valise, and there can be little doubt that the collaboration was mutually beneficial, with something of Cornell’s gentler poetics of childhood rubbing off on the more cerebral Duchamp, and reinforcing his own sense of the artistic potential of toys and games, as he contemplated his First Papers of Surrealism installation. Levitt’s presence alongside Cornell in the ‘Americana Fantastica’ edition of View further suggests that American surrealists trained a spotlight on the culture of childhood, and particularly the phenomena of childish games. This can be underlined by a series of experimental films made by Cornell in the 1940s which take children’s party games as their subject. Rarely discussed in the literature on Cornell, this sequence of so-called ‘collage films’ includes The Children’s Party, Cotillion and The Midnight Party, although the films are profoundly interdependent, being composed of roughly the same found footage. This footage, much of which documents a large Halloween party but which also contains images from a circus and of children dancing in a chorus line, was scavenged by Cornell during visits he made to Manhattan curio shops in the 1930s and 1940s and subsequently edited into three films, with extra footage added at undetermined points in the 1940s.32 One short section of The Children’s Party is worth focusing on: after a sequence of images of circus acts, inter-cut with images of partying children, one sees a close-up of a boy wearing a peculiar looking party hat, who, after taking part in an apple dunking ceremony with other children, lifts his face up towards the camera and displays an enormous apple in his mouth. Whether Cornell was conscious of it or not, the vaguely disturbing image of the apple held in the abnormally stretched mouth would have been an inevitable reminder, for an audience schooled in surrealism, of the images of tribal people with masks and facial adornments published in surrealist journals of the 1920s and 1930s such as Documents and Minotaure (not to mention the exoticising images reproduced at the same time in populist magazines).33 At a certain level, then, this film was indeed an exercise in cultural anthropology, with phenomena such as apple dunking carefully documented as examples of Western ritual behaviour. Once again, the tenor of Cornell’s attentiveness to childhood is close to ‘ethnographic surrealism’. It should be stressed that it is unlikely that Cornell sought to interrogate eurocentrism in the way that this particular analogy between Western and non-Western forms of ritual suggests. In line with mainstream surrealist attitudes, Cornell saw the child as an exotic creature whose participation in a distinctively American vernacular culture of party games and circus entertainments provoked nostalgia for the lost land of childhood. The fact that the natives of the Northwestern Pacific coast head the list is not surprising, given surrealism’s newfound proximity to the region, but it is surely significant that the red cedar tree, or giant cedar, is indigenous to this part of North America, and that Northwestern tribes used this wood almost exclusively in the manufacture of totem poles and masks.36 The significance of cedar and its olfactory qualities will be returned to later, but it is clear that the two statements at the beginning of the exhibition catalogue bring children and so-called ‘primitives’ into structural alignment, indicating that Duchamp was well aware of the prevailing ethnographic zeitgeist. However, it would not be correct to see Duchamp’s deployment of children at the exhibition opening as straightforwardly in line with the attitude of exoticisation or ‘othering’ that was so endemic to surrealism, and so clearly evident in Cornell’s film The Children’s Party. Duchamp’s encouragement of children’s play chimes well with Levitt’s photographs, with which he would have been familiar, while, at the same time, something of the spirit of Cornell’s ‘Americana Fantastica’ is at stake in the way that Duchamp left the children to play their native games at the vernissage (hopscotch, basketball, baseball), and the event undoubtedly speaks to his friendship with Cornell (whose work was not actually chosen by the selectors for First Papers of Surrealism, but, by letting the children play, it can be surmised that Duchamp included him in spirit).37 However, the element of disruption courted on this occasion by Duchamp would have scandalised the timid Cornell. The French artist was well aware that the playing children would get in the way of the black-tie guests at the opening, and this anarchic dimension is linked to a cooler, more intellectual approach to the deconstruction of art and its institutions. The element of calculation in Duchamp’s approach should not be overlooked. Just as he can be seen to be in tune with American surrealism, so it is telling that it was Carroll Janis, the son of Sidney Janis, one of the sponsors of the exhibition and a collector of surrealist art (including that of Duchamp), who led the children’s play.38 Duchamp was not above using the event to consolidate his position in an evolving network of American supporters, with whom the European surrealists had little familiarity. One could equally question whether Duchamp had very much actual interest in the children’s play he set in motion. As already noted, he was absent from the opening itself, as was his customary habit, and the children simply played at his orders. A striking element of control is involved, to the extent that, if one thinks of Duchamp’s interest in game playing as being bound up more closely with the ‘adult’ game of chess, the children at the vernissage may have simply been pawns in a pre-conceived performative gambit. With this in mind, it is important to look beyond the context of the surrealist cult of the child and ask what larger point Duchamp may have been wishing to make at the opening of the 1942 exhibition. To consider this question it is necessary to turn briefly to the Exposition internationale du surréalisme of 1938, held at the Galerie Beaux-Arts in Paris, for which Duchamp created an even more elaborate and disorientating décor than he did for First Papers of Surrealism four years later. While the full complexity of the installation cannot be discussed here, a few highlights from the central exhibiting space or ‘Central Grotto’ of the exhibition should be noted. What is striking about the installation is the way in which a thematic of labour – manual labour – seems to have been in play, almost in counterpoint to the referencing of dreams. The beds, the darkness of the room, the use of flashlights to view the surrealist paintings; all this suggests that the exhibition-goers were ushered symbolically into the space of dreams, which, of course, is entirely in line with surrealist principles. The metaphorical linkages between the brazier, the coal sacks and the flashlights also speak of the idea that the exhibition goers were akin to coalminers, tunnelling into the unconscious. However, the coal sacks and the worker’s brazier simultaneously speak of a different world. The 1930s in France had been a period of constant industrial unrest – which included coalminers’ strikes – and the period immediately prior to the 1938 exhibition saw the demise of the Popular Front, unable to cope with the general industrial and economic downturn. It could be argued that it is precisely this external world that was imported by Duchamp into the Galerie Beaux-Arts in 1938, producing a weird collision of the symbolisation of inner (unconscious) space and brute social reality. The art historian T.J. Demos has interpreted the installation along similar lines, arguing, with reference to the German philosophers Theodor Adorno and Max Horkheimer, that Duchamp’s coal sacks, in their obvious oppressiveness, signalled ‘the wholesale destruction of particularity’ threatened by fascism and capitalism: ‘in their sheer numerical proliferation the sacks of coal bore down on the audience, as if neutralizing the surrealist fetishization of individuality below and expressing the coming absorption of objects by capitalist production.’40 This may be over-stating the case and reducing what was, in spite of everything, a surrealist gesture on Duchamp’s part to the level of literal social critique. However, Demos is right to suggest that, just as Duchamp seems to have been subtly criticising or even undermining surrealism in his 1942 installation in New York, so this process of subversion was at work in Paris in 1938. The conflicting demands represented by actual labour and ideology were therefore central problems for surrealism. What Duchamp seems to have done in his 1938 exhibition installation was point out this problem in terms of the paradoxical conflation of ‘inner’ and ‘outer’ worlds. Duchamp himself was habitually pledged to the notion that play is a necessarily rule-bound activity, as can be deduced from his commitment to chess. However, the games that were played during the 1942 vernissage, however much they were wrapped up in themselves, trespassed into the domain of conventional adult social behaviour and became disruptive. Strictly speaking, therefore, it was not so much children’s play that was at issue, as the structural testing of boundaries. Indeed the performative nature of the vernissage strongly related to dada performances, where an attempt at bewilderment and alienation was often at stake and not mere playfulness. 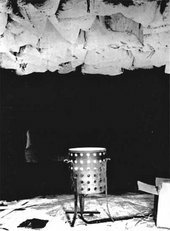 T.J. Demos has convincingly interpreted Duchamp’s 1938 installation in relation to the First International Dada Fair held in Berlin in 1920, and this comparison works especially well for the 1942 event when it is considered that no distinction or distance was established between the performance and the audience. Instead a kind of environment was actually created. The 1942 vernissage, with its focus on a unitary structural shift (gallery opening turned into play arena) actually seems to presage some of the Fluxus performances and happenings of the early 1960s, in which the relation between performance and audience was eradicated.47 Significantly, Duchamp had had no involvement in the formative live performances of the dada period.48 He came to the form late, and when he did so in 1942 it was precisely in order to reinsert the possibility of dada into a surrealist context, a point that serves to emphasise Duchamp’s concern with subverting the tenets of surrealism. If the 1942 vernissage was effectively a precursor of neo-avant-garde performance art, it is also worth asking how Duchamp’s practice here, and in the installation of 1938, can be indexed to the critic Peter Bürger’s notion of the avant-garde proper. Bürger’s famous contention that the so-called ‘historical’ avant-garde was primarily motivated by a desire to sublate the principles of art and life fits rather cosily onto the account of the incursions of work or play into art that have been discussed. Beyond that, however, it has little explanatory power. More interesting theoretical possibilities arise from considering how the principles of work and play act on each other from one event to the other. The art historian Gavin Grindon has recently argued that the negative cast of Bürger’s theory (the idea that the avant-garde heroically ‘failed’ to dissolve the autonomous institution of art while the neo-avant-garde dismally repeated this failure a second time) obscures what was positive about the ‘refusal of work’ posited by the historical avant-garde.49 According to Grindon, the avant-garde preserved a notion of the autonomous nature of art activity linked to the philosophical conception of play articulated by the eighteenth-century German philosopher Friedrich Schiller in The Aesthetic Education of Man (1795). According to Schiller, as summarised by Grindon, ‘artistic production and aesthetic contemplation resolve the rational and sensuous aspects of man in the form of a play drive’.50 This positive autonomy of art-as-play is preserved by the avant-garde in opposition to the negative valuation ascribed by them to the autonomy of art-as-commodity under capitalism. It is thus necessary for the avant-garde to oppose the idea of labour as something bound up with the production of art-as-commodity. This refusal goes hand-in-hand with the refusal of the role of the artist. ‘Play’ can thus be opposed to the idea of ‘work’ in relation to a more positive and radicalised notion of artistic identity and value. It might then be argued that Duchamp was keenly aware of the dialectic between work and play as central to the unfolding of surrealism. Duchamp’s thematisation of labour as the occluded ‘other’ of surrealism presented in the 1938 exhibition, reveals, as has been argued, the paradoxical nature of a movement that supported a communist cause but which at the same time refused to engage in ‘work’. Yet by the late 1930s surrealism had already capitulated to the market, and its rhetoric of the refusal of artistic labour had long since subsided. In the 1942 exhibition Duchamp seems implicitly to have posited that the return to the principle of play was the only means of reconnecting with a genuine avant-gardism. It is time now to return to the peculiarly olfactory dimension of the 1942 vernissage, in other words to the ‘odour of cedar’ that, according to the exhibition catalogue, supposedly accompanied the children’s play. As it happens, smell had played a role in the Exposition internationale du surréalisme in 1938, namely the scent of roasting coffee (a possible allusion to Duchamp’s small painting Coffee Mill of 1910), which had been provided courtesy of a coffee-roasting machine installed by the poet Benjamin Péret.51 In 1942 the reference to the ‘odour of cedar’ in the exhibition catalogue, while connoting tribal objects from the Northwest coast, might be understood as a knowing nod on Duchamp’s part to the values of spirituality and healing that are traditionally linked to the cedar tree.52 Childhood, Duchamp appears to have suggested, is regularly seen in similar terms, as something linked intrinsically to natural purity and spirituality, and, in drawing out these associations, Duchamp alluded to friends such as Cornell, as well to the surrealist veneration for the state of childhood. In the 1942 exhibition Duchamp seems to have asserted, in highly coded terms, that such values are precisely what the art displayed around the walls is unable to deliver. The spontaneity and freshness of childhood was thus mobilised, in structural terms, against the surrealism for whom children were such exotic creatures and whom recent American surrealist discourse had positioned as anthropological specimens to be considered on a par with ‘primitives’. Duchamp thus pointed to something beyond the capacity of surrealism. In a last ditch attempt to recover the movement’s avant-garde impetus, he offered them a tangled cat’s cradle and the faintest whiff of the sensuous qualities of play. 1. For a full account of Duchamp’s installation see Lewis Kachur, Displaying the Marvellous: Marcel Duchamp, Salvador Dali and Surrealist Exhibition Installations, Cambridge, Massachusetts 2001, pp.179–81. While press reports of the period suggested that Duchamp had used sixteen miles of string, it is now generally agreed to have been between one and three miles. I am indebted to Kachur’s carefully researched text for many of the basic details of the staging of First Papers of Surrealism. 2. Robert Coates, ‘Sixteen Miles of String’, New Yorker, no.18, 31 October 1942, p.72, cited in Kachur 2001, p.191. 3. For a broad discussion of the relationship between Duchamp and Breton see Dawn Ades, ‘Duchamp, Dada y Surrealismo’, in Duchamp, exhibition catalogue, Fundació Joan Miro, Barcelona 1984, pp.38–51. See also Robert Lebel, ‘Marcel Duchamp and Robert Lebel’ in Marcel Duchamp, Museum of Modern Art, New York 1973, pp.135–41, and Kachur 2001, pp.89–95. 4. For Duchamp’s antipathy towards surrealism see David Hopkins, ‘Duchamp, Surrealism and “Liberty”: From Dust Breeding to Etant Donnés’ in Anne Collins Goodyear and James W. McManus (eds. ), aka Marcel Duchamp: Meditations on the Identities of an Artist, Washington D.C. 2014. See also David Hopkins, ‘The Politics of Equivocation: Sherrie Levine, Duchamp’s “Compensation Portrait” and Surrealism in the USA 1942–45’, Oxford Art Journal, vol.26, no.1, 2003, pp.45–68. 6. Some scholars have also interpreted the web of twine in relation to notions of dislocation underpinned by the mythological and literary preoccupations of the surrealists in the late 1930s. For example the string might refer to Ariadne’s thread and to the surrealist fascination with the minotaure. Georges Bataille’s 1936 essay ‘The Labyrinth’ has also been pressed into service as a possible reference point. See T.J. Demos, The Exiles of Marcel Duchamp, Cambridge, Massachusetts 2007, pp.190–242. See also Hopkins 2003, pp.45–7. Duchamp himself had only been in New York since June 1942, a few months prior to the show, although for him this was a return to a city where he had many friends and contacts, having lived there between 1915 and 1923. 7. See Arturo Schwarz, The Complete Works of Marcel Duchamp, 1969, revised edn, London 1997, vol.1, p.520, no.162. 8. See David Hopkins, Marcel Duchamp and Max Ernst: The Bride Shared, Oxford 1998, p.17. 9. For a useful account of this bilboquet see Matthias Mühling, ‘Bilboquet, 1910’, in Helmut Friedel, Thomas Girst, Matthias Mulhing and Felicia Rappe (eds. ), Marcel Duchamp in Munich 1912, exhibition catalogue, Lenbachaus, Munich 2012, pp.110–12. 10. See Francis M. Naumann and Bradley Bailey, Marcel Duchamp: The Art of Chess, New York 2009. 11. André Breton, ‘First Manifesto of Surrealism’, in Manifestoes of Surrealism, trans. by Richard Seaver and Helen Lane, Ann Arbor 1972, pp.3–4. 12. For a useful summary of the availability of Freud’s texts in French, and therefore to the majority of the surrealists, see Jennifer Mundy (ed. ), Surrealism: Desire Unbound, exhibition catalogue, Tate Modern, London 2001, p.58. 13. For an image of Max Ernst’s Two Children are Threatened by a Nightingale 1924 see http://www.moma.org/collection/object.php?object_id=79293, accessed 17 October 2014. For an image of Dorothea Tanning’s Eine Kleine Nachtmusik 1943 see http://www.tate.org.uk/art/artworks/tanning-eine-kleine-nachtmusik-t07346, accessed 17 October 2014. 14. For an excellent account of Cornell’s quasi-Victorian approach to childhood, and the literary parallels to his work in fairy stories and children’s literature, see Analisa Leppanen-Guerra, Children’s Stories and ‘Child-Time’ in the Works of Joseph Cornell and the Transatlantic Avant-Garde, Farnham 2011. Possibly the best general account of Cornell’s melancholy poetics, in relation to childhood, remains Dawn Ades, ‘The Transcendental of Joseph Cornell’ in Kynaston McShine (ed. ), Joseph Cornell, exhibition catalogue, Museum of Modern Art, New York 1980, pp.15–41. For a comparison of the work of Bellmer and Cornell and the possible proto-paedophilic dimension of Cornell’s work see David Hopkins, ‘The Child in Surrealism’ in Karen Lury (ed. ), The Child in Film, forthcoming. 15. Susan Stewart, On Longing: Narratives of the Miniature, the Gigantic, the Souvenir, the Collection, Durham and London 1993, pp.63–5. 17. For an account of the relationship between Cornell and Duchamp during this period see Ann Temkin, ‘Habitat for a Dossier’ in Joseph Cornell/Marcel Duchamp…in resonance, exhibition catalogue, Philadelphia Museum of Art, Philadelphia 1998, pp.79–93. 18. Joseph Cornell, 1936, cited in Ades 1980, p.19. 19. Roger Caillois, ‘The Myth of Secret Treasures in Childhood’, VVV, no.1, June 1942. For an English translation see Claudine Frank (ed. ), The Edge of Surrealism: A Roger Caillois Reader, Durham and London 2003, p.255. 21. Michel Leiris, ‘The Sacred in Everyday Life’, trans. by Betsy Wing, in Denis Hollier (ed. ), The College of Sociology 1937–39, Minneapolis 1988, p.24. 22. James Clifford, The Predicament of Culture: Twentieth-Century Ethnography, Literature and Art, Harvard 1988. 23. For images of the ‘Americana Fantastica’ issue see http://www.bibliopolis.net/cote/viewdata.htm, accessed 17 October 2014. 24. For a discussion of the ‘Crystal Cage’ dossier, and the associations surrounding Berenice, see Jodi Hauptman, Joseph Cornell: Stargazing in the Cinema, New Haven and London 1999, pp.170–9. Analisa Leppanen-Guerra has also noted that there may be links between the figure of Berenice and the protagonist of Antoine de Saint-Exupéry’s novella The Little Prince (1943). Saint-Exupéry was actually engaged in writing the story at this time during a temporary stay in America, and was in touch with the surrealists. Introduced by either Breton or Duchamp, Saint-Exupéry probably met Cornell at a party in late 1942. The link is yet further evidence of how the theme of childhood held sway at this time. See Leppanen-Guerra 2011, pp.71–113. 25. See http://www.bibliopolis.net/cote/viewdata.htm, accessed 17 October 2014. See also Leppanen-Guerra 2011, pp.38–9. 28. For a useful short discussion of Levitt and surrealism see Sandra S. Phillips, ‘Helen Levitt’s New York’, in Sandra S. Phillips and Maria Morris Hambourg, Helen Levitt, exhibition catalogue, San Francisco Museum of Modern Art, San Francisco 1991, pp.27–32. 29. Julien Levy Gallery was a central venue for surrealist art and photography in New York. See Ware Barberie, Dreaming in Black and White: Photography at the Julien Levy Gallery, exhibition catalogue, Philadelphia Museum of Art, Philadelphia 2006. 31. Ethel and Oliver Hale, ‘From Sidewalk, Gutter and Stoop: Being a Chronicle of Children’s Play Activity’, unpublished typescript, dated 1955, New York Public Library, Manuscripts Division, Box 1, p.97, cited in Phillips 1991, p.42, note 48. 32. The dating of Cornell’s ‘collage films’ is uncertain. They seem to have been created in the 1940s, but they were finally completed with the help of the filmmaker Larry Jordan in 1965. See P. Adams Sitney, ‘The Cinematic Gaze of Joseph Cornell’ in Kynaston McShine (ed. ), Joseph Cornell, exhibition catalogue, Museum of Modern Art, New York 1980, pp.77–8. 33. Cornell may have seen the photographs of tribal head adornments and masks in Ralph von Koenigswald’s essay ‘Têtes et Crânes’, published in Documents, no.6, 1930, pp.353–8. He would also have been aware of the second issue of Minotaure, published in 1933 and devoted to the ‘Mission Dakar-Djibouti 1931–1933’. 34. First Papers of Surrealism, exhibition catalogue, Coordinating Council of French Relief Societies, Inc.,New York 1942, p.3. 36. For an excellent set of essays on the surrealist taste for Northwest Pacific coast artefacts see Dawn Ades (ed. ), The Colour of My Dreams: The Surrealist Revolution in Art, exhibition catalogue, Vancouver Art Gallery, Vancouver 2011. 37. It is worth noting that, in the wake of First Papers of Surrealism, Levitt had her first exhibition, titled Photographs of Children, at the Museum of Modern Art, New York, in early 1943. 38. Sidney Janis and his wife Harriet wrote a lengthy essay on Duchamp in the special issue of View devoted to the artist, which was published in March 1945. See Harriet Janis and Sidney Janis, ‘Marcel Duchamp, Anti-Artist’, View, series 5, no.1, 1945, pp.18–54. 39. See Kachur 2001, pp.68–88. 41. See Hopkins 2003, pp.56–9. 42. André Breton, ‘Second Manifesto of Surrealism’, in Manifestoes of Surrealism, trans. by Richard Seaver and Helen Lane, Ann Arbor 1972, p.143. 43. For a reproduction of this photograph see Roger Cardinal and Robert Stuart Short, Surrealism: Permanent Revelation, London 1970, p.14. 44. André Thirion, ‘A Bas le Travail’, Variétés, special issue, ‘Le Surréalisme en 1929’, 1929, p.45–6. See also Gavin Grindon, ‘Surrealism, Dada, and the Refusal of Work: Autonomy, Activism, and Social Participation in the Radical Avant-Garde’, Oxford Art Journal, vol.34, no.1, 2011, p.84. 45. Johan Huizinga, Homo Ludens: Versuch einer Bestimmung des Spielelements, Amsterdam 1938, first translated into English as Homo Ludens: A Study of the Play Element in Culture, London 1949. Roger Caillois, Les jeux et les hommes, Paris 1958, first translated into English as Man, Play and Games, Urbana and Chicago 1961. 46. Johan Huizinga, Homo Ludens: A Study of the Play Element in Culture, New York 1950, p.13. 47. Demos 2007, pp.178. It should also be mentioned that a performance event of sorts had also been a feature of the opening of the 1938 Exposition internationale du surréalisme. Breton, Paul Éluard and other surrealists were much more involved in organising this event, which was far more conventionally ‘theatrical’ than Duchamp’s 1942 performative intervention. See Kachur 2001, pp.86–8. 48. The scandal surrounding the exhibition of Duchamp’s Fountain 1917 (see Tate T07573) and the creation of his female alter-ego Rrose Sélavy relied on photographic and textual inscription to create virtual events or performances. 50. Ibid., p.82 (Grindon’s italics). 51. See Kachur 2001, p.93. 52. The key biblical source linking the cedar with spiritual strength is Psalm 92: ‘The righteous shall flourish like the palm tree: he shall grow like a cedar in Lebanon’ (Psalms 92: 12). It is also worth noting that the smell of cedar wood is widely acknowledged to be a repellant capable of keeping away insects of various kinds. Perhaps Duchamp would have been amused at this idea, using the smell to guard the play of his children from either the upper-class guests at the vernissage or other uncomprehending or malign forces. The ‘odour of cedar’ also has a distinct connection to another work by Duchamp, namely his mock perfume bottle, Belle Haleine: Eau de Voilette of 1921. ‘Eau de Voilette’ (veil water) is clearly a play on ‘Eau de Violette’, a reference to ‘Eau de Toilette’ with a violet fragrance, which was fashionable as a perfume spray in the 1920s. My thanks to the anonymous reader of this essay, who prompted this note. An earlier version of this paper was presented at Tate Liverpool on 31 January 2014 as part of The Ludic Museum, a symposium organised by Antony Hudek, Stephanie Straine and Lindsey Fryer. Other papers relating to the theme of the ludic museum can be found in Tate Papers no.22. David Hopkins is Professor of Art History and Director of the Institute of Art History, University of Glasgow. David Hopkins, ‘Duchamp, Childhood, Work and Play: The Vernissage for First Papers of Surrealism, New York, 1942’, in Tate Papers, no.22, Autumn 2014, https://www.tate.org.uk/research/publications/tate-papers/22/duchamp-childhood-work-and-play-the-vernissage-for-first-papers-of-surrealism-new-york-1942, accessed 21 April 2019.